Tourist pub but with well maintained Victorian features especially tile work. Square shaped bar, relatively small but plenty of seating suited to theatre crowd. It lacks much in the way of personality and there is little to separate from many other pubs in the West End but the ale was well kept and it does the job if you're passing by. Popped in here about 1.30 pm the other day and it was standing room only. Not surprising as it's in a prominent position and very popular with tourists. The beers on offer were Doombar & Rev James. The R J was okay. I didn't eat at all though plenty of others were tucking in so they must be doing something right. An okay pub for a quick drink but not one I would stay in for too long and there are better available not far away. Good service, with none of the problems encountered below. Beer fabulous and the pre-Christmas atmosphere was great. Certainly one of the better pubs in the area. On the tourist trail so watch your change as the tall short haired barman will try and short change you. 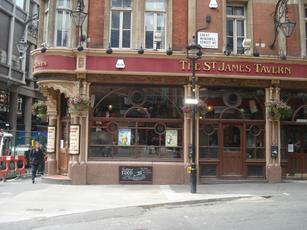 I took 6 Norwegians to this pub Friday 13th December 2013 around 2000 - 2030. I asked for x 3 guinness, x 3 Heineken and a cider. £30.40 - fair doos London prices - cannot complain. Gave the barmen (tall short hair) x 1 £20 as I could not hear him over the music. He made a joke as if to make me look stupid. OK so I acknowledged my mistake and gave him x 2 £20s and expect £10.60 change. You can guess what happened he put 0.60p change in my hand and moved off REAL sharpish. Normally I do not check my change but the fact that he ran off got me suspicious and low-and-behold I was a tenner down. Finally I got his attention and made him aware of his 'error' he said he would have to contact the manager. But again he went off sharpish not giving me time to say to him to turn the music down as anything we say must be witnessed. I was not going to be accused of fraud by him. He went just around the other side of the bar where I could not see him (probably to get the stashed tenner) clicked the til open and returned my change. By the way the money wasn't even mine you thieving scum. Popped in as the Northern Line was up the spout so had to change at Piccadilly Circus. London Fields was good and the barman even topped the head up, but others weren't so lucky; perhaps I looked like a serious beer drinker. My wife liked the wine as it was cold (not always a given) and fresh (likewise). Had difficulty getting served for our second drink and I suspect the bar man only did so after we were comparing the service we get in Ireland (which is excellent). I'll call in again another time to see if my experiences were one offs or standard.